Oxybenzone or as it’s also known, benzophenone, or more technically known benzophenone-3 is a type of chemical sunscreen. If you’ve caught whisperings of any 3 of those phrases, you’ve heard gossip about oxybenzone. And my friend, let me tell you there is a lot of gossip about oxybenzone. Oxybenzone sunscreens will give you sensitive skin. Sunscreen formulas containing oxybenzone mimic the effects of human hormones aka they’re hormone disruptors. and… Using a sunscreen with oxybenzone helps promote the bleaching of pretty sea corals having a huge impact on the environment. But my fellow skin savvy, I know you’re not one to believe scaremongering claims unless they have solid scientific evidence about them. Which is why you’re here with me today ‘eh. So, lets get our metaphorical dig on and find out if you truly should be avoiding sunscreens with oxybenzone. Skincare ingredients sound alien, but trust me, once you begin to learn a few names, ‘ET comes home’. It’s like learning a new recipe. When you make bread, you have flour, yeast and water. If you want a fancy bread, you might put in some paprika, nuts and olives. If you wanted even fancier bread you might top off the loaf with some grated extra matured cheddar. Recipes have layers and once you begin to understand the makeup of those layers, you begin to recognise those originally alien sounding ingredients. Oxybenzone is a basic layer in sunscreen formulas. It’s like the yeast. Oxybenzone is a chemical sunscreen ingredient that lends a sunscreen formula it’s ability to protect your skin against UV light. It spreads onto your skin and sits there until a UV ray says hello. When it does, oxybenzone becomes a hungry little caterpillar, eating up UV light and ‘pooping’ it out the other end as something no longer resembling UV light aka it’s no longer dangerous to your skin. …and as you already know, all hungry little caterpillars, do not stay in hungry caterpillar form for long. Once these guys have eaten as many UV rays as they can handle, they’re birthed into beautiful little butterfly’s that leave your skin in need of another sunscreen application. If you’d like to know a little more about sunscreen lingo and the difference between chemical and physical sunscreens, be sure to grab a copy of this free 1-page sunscreen lingo crib sheet. Just click here or below to grab yours. Should You be Afraid of Oxybenzone Sunscreens? As of the 3rd September 2017 the legally allowed amount (by the EU) of oxybenzone in sunscreens and face creams will change. Previously allowed in sunscreen formulas at a concentration of 10%, EU safety teams have gotten back together and decided with the information available, the limit should be changed. Interesting ‘eh. Currently at 10%, the new oxybenzone limit will be set at 6% for sunscreen lotions and 0.5% for other cosmetic products. This new regulation also instructs that any formula containing oxybenzone should be putting the phrase, ‘Contains Benzophenone-3’ on the bottle. Which points to a very real and truthful concern. 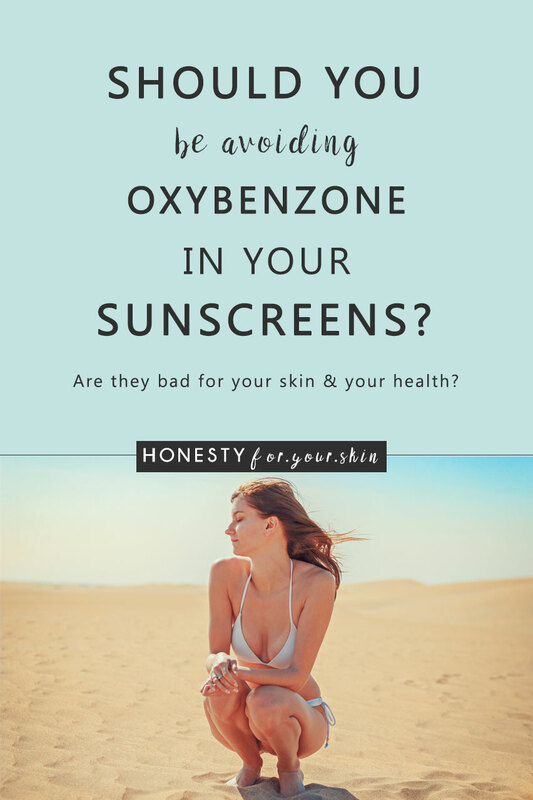 If you have a sensitive or reactive skin type, oxybenzone sunscreens are best avoided. Benzophenones were named as contact allergen of the year in 2014 by the American Contact Dermatitis Society. Which basically means, quite a few people experience allergic reactions when using creams and sunscreens containing Benzophenones… of which oxybenzone/benzophenone-3 is one. As this ingredient is becoming more and more frequently used, rates of allergy are increasing. It’s like having a weakness to gluten, wheat or dairy, living well eating all of these foods, until 1 day your body just says no. There’s a second level to this… photoallergy. Oxybenzone is a chemical sunscreen ingredient which means – it’s a hungry little caterpillar. Chemical sunscreen ingredients work because they react with (/eat up) UV light to break it down into non-skin cancerous ingredients. The trouble is, this reaction also makes ingredients which can aggravate, irritate and sensitise skin… and here comes oxybenzone trouble no.2 – photoallergy. Bottom line, if you have sensitive or reactive skin, your perfect sun protection will be an oxybenzone free sunscreen… of which I have some great recommendations for you very soon – stay tuned. But first, should you avoid oxybenzone based sunscreens if you don’t have sensitive or reactive skin? Are they safe to use for normal, non-reactive skin types? Are Oxybenzone Sunscreens Safe to Use? Now this is where the ‘Is oxybenzone safe to use’ waters become a wee-bit murky. What we do know is that oxybenzone in small amounts is absorbed through skin and detected in people’s blood and urine. It’s really good that it’s detected in urine because this part means the human body can ‘get rid’ aka you don’t have a traffic jam of oxybenzone build-up. Of the many chemical sunscreen ingredients used, oxybenzone penetrates skin most significantly. This study shows that 10% of a sunscreen lotion (not 10% of oxybenzone, but 10% of the complete lotion) is able to penetrate through the epidermis fully. Epidermis being the top layers of skin which sit above the dermis – layers of skin containing blood vessels and nerve endings. Other studies show 2% of the applied dose of oxybenzone is later detected in urine samples. And more studies show that using oxybenzone sunscreens with insect repellents containing DEET increase the amount of oxybenzone skin absorbs. Of all sunscreen ingredients, this is why oxybenzone in particular has a bad reputation. It’s absorbed through skin noticeably in much greater quantities than other sunscreen ingredients and realistically, we do not yet know the effects (if any) on the human body. Oxybenzone has estrogenic activity in fish and in certain studies that the ingestion of oxybenzone builds up i.e. fish cannot poop out oxybenzone aka it bioaccumulates. The presence of oxybenzone in urine is correlated with unhealthy changes in sperm. These health links and theories are still in early stages. It’s like finally understanding what’s causing you acne or what triggers your eczema, you have to test it out a few times to truly know whether the diet change you made/the new skincare regimen you invested in is the reason for your positive effects. However, what is known is that oxybenzone is very bad for our beautiful coral reefs. So, if you’re sat on the fence and want something to push you either way, protecting the environment could be just the thing. Whether you want to seek oxybenzone free sunscreens for your sensitive or reactive skin, for a safer, less controversial alternative to sun protection or for reasons of cheerleading for the environment… I have just the list for you. Below you will find 4 great oxybenzone free sunscreen alternatives. There are picks for ultra sensitive skin, picks for those looking only for physical sunscreen filters (I’ll explain all soon) and even for those wanting a promise of great rub in and absorbability. Looking for a quick solution? Just check out the ‘For You If:’ lead. For You If: You want high SPF, all natural sun protection for face and have an oily/combination skin type and a light to natural skin tone. The BioSolis Extreme Fluid – SPF 50+ has significant natural street cred. It’s formula is full of natural ingredients, with 99% being from natural sources and a further 25% from organic farming. It’s also ECOCERT stamped speaking loudly to the BioSolis commitment of natural and organic. The milky fluid is made only from physical sunblocking ingredients meaning its a perfect bet for sensitive skin types. As with many physical sunblock’s, this high SPF sunscreen may leave you with whitening effect aka white cast, making it best for light to natural skin tones. Top tip; using under foundation helps to counteract whitening. Active sun protection ingredients; Titanium Dioxide, Zinc Oxide – 100% physical sunblock ingredients. Where to buy? via BigGreenSmile – £13.50/40ml. For You If: You want an extremely cost-effective oxybenzone free sunscreen that’s easy to rub in and great for both face and body. Soltan sunscreens are the creation of Boots, so if you’re on the lookout for this beauty, know you’ll only find her from Boots online or Boots on the high-street. The most important part of using a sunscreen effectively is making sure to rub enough of it in. You only get the rated SPF30 if you rub in at least 2mg per cm2 of skin. Which works out as roughly a quarter teaspoon for a full face application. Sometimes this can be a hard task, especially with physical sunscreens, however rub in is made a dream with the Soltan Sensitive Hypoallergenic Suncare Lotion SPF30. Boots are also creators of the UVA star rating system. See, SPF only rates your skin’s protection against UVB light and therefore sunburn and skin cancer. However it’s UVA light which is most responsible for the very ageing effects of sunlight. This is where the star system comes into play, there’s 5 stars at most and if you see all 5 highlighted like they are for Soltan Sensitive Hypoallergenic Suncare Lotion SPF30 you have a very high protection against UVA light and therefore photo ageing. Active sun protection ingredients; Octocrylene, Butyl Methoxydibenzoylmethane, Bis-ethylhexyloxyphenol methoxyphenyl triazine, Ethylhexyl salicylate, Diethylhexyl butamido triazone, Titanium Dioxide. Where to buy? via Boots – £6.50/200ml. For You If: If you want next generation, moisturising, sensitive skin friendly, anti-ageing sunscreen protection. In fact choose any ‘Anthelios‘ branded sunscreen and you’re guaranteed a next generation, anti-ageing, oxybenzone free sunscreen. The Anthelios range relies on a combination of sunscreen ingredients with 2 being patented by L’Oreal – the owners of La Roche-Posay aka you won’t find these in any non L’Oreal products. The patent is for 2 ingredients nicknamed when together as Ecamsule and when separate as Mexoryl SX and Mexoryl XL. Studies show these ingredients combined are great at halting UV damage, especially the ageing kind, and doing both extremely sensitively. Active sun protection ingredients; Octocrylene, Ethylhexyl Salicylate, Butyl Methoxydibenzoylmethane (avobenzone), Bis-Ethylhexyloxyphenol, Methoxyphenyl Triazine, Ethylhexyl Triazone, Drometrizole Trisiloxane (aka Mexoryl XL), Terephthalylidene Dicamphor Sulfonic Acid (aka trade name Mexoryl SX aka ecamsule). For You If: You want an extremely natural, sensitive skin friendly sunscreen but are fed up with hard to rub in zinc oxide white cast. Green People’s Scent Free Sun Lotion SPF30 is a great alternative to all natural physical sunblock’s i.e. ones that contain zinc oxide and ones that often give skin a white Casper like sheen. It’s great if you suffer with sensitive skin, great if you often experience prickly heat and perfect if you’re looking for a natural approach to your skincare with over 78% of the formulas ingredients being from organic and natural sources. A pretty awesome stat ‘eh. Instead of using natural physical sunblock ingredients, Green People’s Scent free sun lotion uses naturally derived sunscreen ingredients, that are much easier to rub in and leave little to no white cast. Does your skin itch or break out into tiny red spots after spending time in the sun using a waterproof sun lotion? If these issues sound familiar to you, you may suffer from prickly heat which is caused by sweat becoming blocked in the epidermis of your skin. Our natural sun creams for prickly heat allow your skin to breathe as the organic ingredients work with your skin, rather than stifling it, and give you effective UVA and UVB protection. Active sun protection ingredients; Isoamyl p-methoxycinnamate, Diethylamino Hydroxybenzoyl Hexyl Benzoate, Titanium Dioxide. Where to buy? via GreenPeople – £22/200ml.